We get to work on some very interesting business apps here at Zenware. Our latest project, Everything Whitetail, just hit the App Store and the Google Play Store. If you’re a hunter you probably know the world renowned hunter Ron Spomer. We’ve been closely working with him and his team to develop an iPhone and Android app. This isn’t a game it’s a rich application loaded with hunting tactics, information about deer characteristics & traits, gear, training videos, trivia, hunt reports and more. 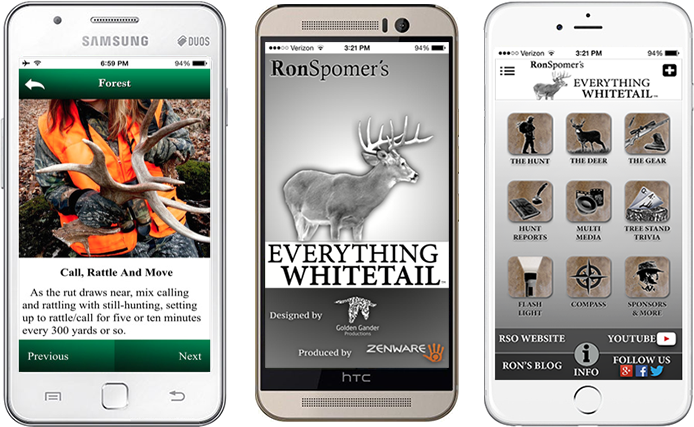 The app was designed for hunters of all ages and abilities. A key feature of the app is the Hunt Reports. Hunt Reports gives you access to an easy to use, detailed report and note system that include GPS location, weather, photos and even your whitetail score. View, edit and even share your reports with friends. Have a secret spot? Record the information as part of your hunt but opt to not share your secret location with others. Everything Whitetail is sponsored by Barnes Bullets, Boone and Crockett, LOWA Boots, National Shooting Sports Foundation and Republic Forge. If you’re a hunter you need to include this app in your arsenal. Download the App today and let’s go hunting!